The International Conference Center of CIHEAM-IAMC "Albert Simantov", established in 1990, offers multipurpose versatility, state of the art technology and high quality standards of service in the highest value for money. Conceived with respect to the environment in an academic atmosphere, it is dedicated to accommodate Academic and Research Conferences, Ministerial Meetings, Seminars, Symposiums, Summer Schools, with a full range of integrated organisational support services; it hosts simultaneously or independently exhibitions and poster sessions. It is situated in a picturesque, typical Mediterranean pine-tree forest setting, surrounded by a botanical garden, a prestigious location 3 km south-east of the city of Chania, 14 km from the international airport and 2 km from the port. It can host up to 13 parallel sessions with total capacity of 600 attendees. The Professional Conference Organizers of CIHEAM-IAMC’s Conference Bureau combines knowledge, professionalism, consistency and the expertise of highly skilled personnel and executive staff to organize meetings and conferences assisted by specific conference management software. It facilitates functions relevant to conference organization such as marketing, budgeting, advertising, scientific program, social program, and registration. It also offers secretarial multilingual services before, during and after the event. 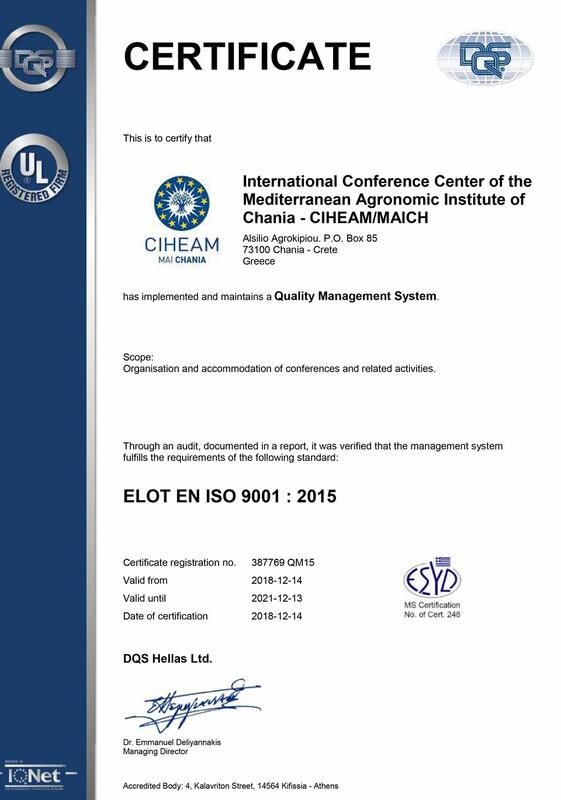 The Conference Center Bureau of the Mediterranean Agronomic Institute of Chania has been certified by DQS GmbH with DIN EN ISO 9001:2008 for the organization and accommodation of conferences and related activities. The International Conference Centre of CIHEAM-IAMC is an organized set of infrastructures and services with international standards, excellent know-how and the highest value for money on the market.